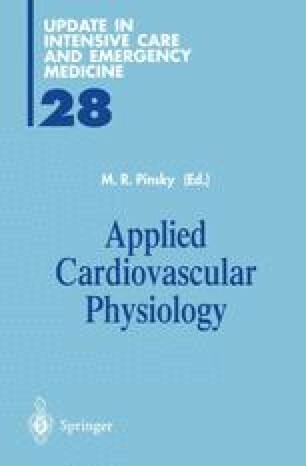 Maintenance of adequate oxygen delivery to the cells to meet their ongoing demand is a crucial function of the cardio-respiratory system both in health and disease. Under normal conditions, oxygen delivery to the cells is controlled by the metabolic rate of the cells, that is oxygen delivery is a demand driven process [1–3]. In various pathological conditions the cardio-respiratory system may be unable to meet the oxygen demand of the tissues. Thus, manipulation of the bulk transport of oxygen (TO2) is a frequent intervention in the intensive care patients. However T02 is only one part of the processes involved in the ultimate delivery of oxygen to the tissues (DO2). The latter process essentially involves the following steps: Firstly oxygen is taken up from the atmosphere and diffuses from the alveolus to the capillary blood where it is transported bound to hemoglobin and, to a much lesser extent, dissolved in the plasma. Then, the cardiac output is distributed into the systemic circulation and ultimately delivered into the microcirculation. Finally oxygen is released from hemoglobin and diffuses from the intravascular space into the cells were it is utilized to maintain cell functions. These steps can be broken down to several detailed processes that will be discussed in this chapter. A good understanding of the physiology of the processes involved can help to understand and treat problems of tissue oxygenation in our critically ill patients.